Rain on Your Wedding Day? This Couple Nailed it Anyway! 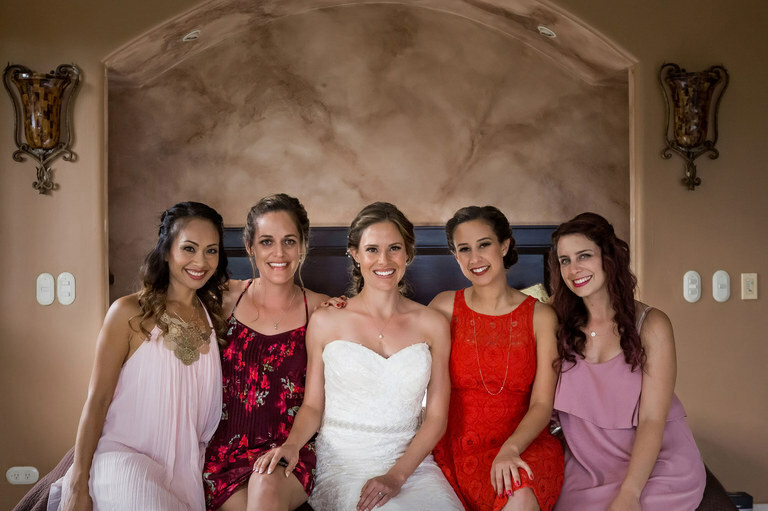 Check out Jen’s epic bouquet! Does having rain on your wedding day terrify you? Some folks love the idea of a tropical wedding, but they’re concerned about tropical storms. They want their wedding to be perfect and a sudden shower during an outdoor ceremony doesn’t sound pleasant. However, the green season in Costa Rica offers a lovely backdrop. Partially cloudy skies offer the chance for sunsets far more spectacular than summertime ones. Plus, the rainforest is a deeper shade of green and peppered with brilliant tropical flowers. Even coming during the summer doesn’t guarantee clear skies for your wedding day. Rain can come at any time in the rainforest. But rain on your wedding day doesn’t mean that all is lost. Just check out the amazing images that I got at Jennifer and Mike’s spectacular wedding in Uvita, Costa Rica. Jen and Mike are a super laid-back couple and were such a pleasure to spend the day with. They were so sweet and surprised me with an unusual question. They wanted to know which of the photos were my favorites of the bunch. If you know anything about me you know that I love to seek out real, emotional moments to immortalize with my camera lens. The fact that they gave me the chance to do that made me super happy. I loved the photos of Mike dancing with his mom. I feel like many parents can look at those photos and connect with what mom’s feeling in that moment. In one of the shots, Jen is looking on in the background with a smile that says it all. I’ve included a couple of them here so you can see. In a huge compliment to me, they indicated that they not only loved the photos but that they took them right back to how they felt in the moment. That’s what I strive for in wedding photos. I want to capture the real, the raw, and the beautiful things people feel on their wedding day. I’m so glad I was able to be a part of Jen and Mike’s special day. Can’t get enough of this gorgeous dress! Jen and Mike were looking for a chill place to have an intimate wedding with their closest friends and family. They found it in Villa Mareas on the Pacific coast near a tiny town called Uvita. Though Uvita is small, it is a popular tourist destination because of the famous whale’s tail National Park. However, you won’t find crowds or big fancy resorts like in Tamarindo or Manuel Antonio. What you will find are relaxing getaways like Villa Mareas. This was the perfect spot for Jen and Mike. And even though the day dawned a little rainy, their wedding was spectacular and most assuredly an event to remember. 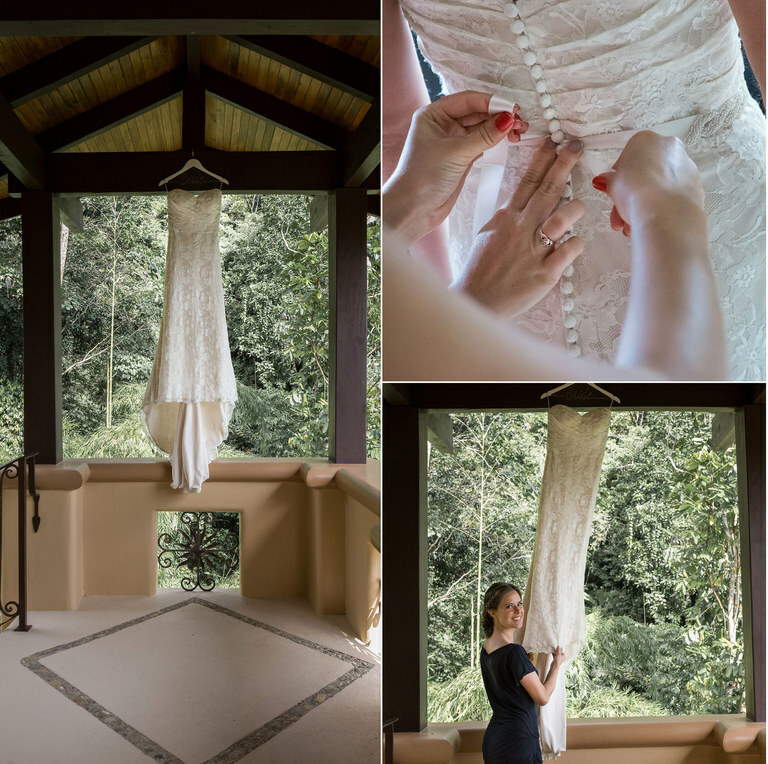 Pilar, the in-house wedding coordinator at the villa made it simple to plan. Plus, the 36-acre estate offers 9 unique suites in an 18,000 square foot luxury villa. Even with a little rain on the day of the wedding, there was no shortage of epic vistas. The ceremony was held in a covered spot surrounded by the vibrant green jungle. As far as beautiful, secluded wedding spots go, it’s hard to beat this one. Just after the ceremony, the rain cleared up a little. It was still sprinkling a bit but the wedding couple was up for heading down to the beach. It turned out that it was a good thing we decided to go. We got some beautiful shots. And then as sunset approached the mix of clouds and water in the sky made for a spectacular backdrop. The colors in the sky were some of the most gorgeous I have seen. Talk about cotton candy skies! Rain on the wedding day isn’t dampening these smiles! This is one my favorites of these two! Love the look on Mike’s mom’s face! I think many parents can relate. Jen’s smile in the background completes a perfect photo. A little rain on the wedding day brought beautiful cotton candy skies at sunset! 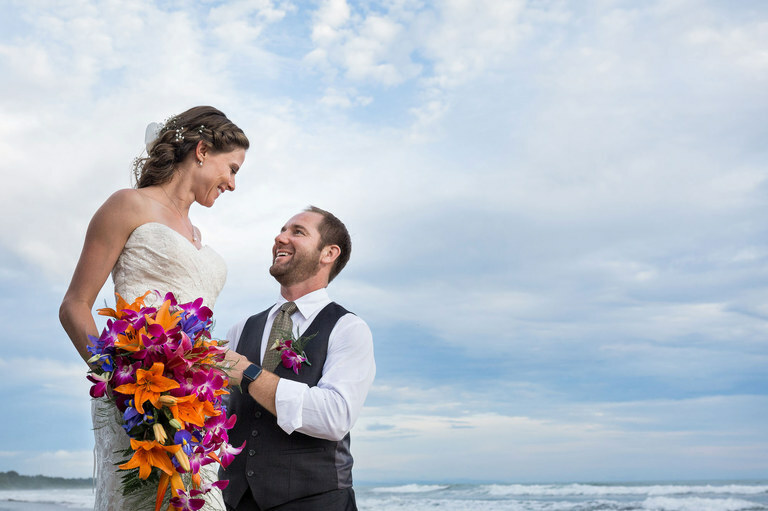 Don’t let the possibility of rain on your wedding day keep you from enjoying an epic destination wedding. Jen and Mike didn’t and as you can see, it did nothing to dampen (pun intended, hahaha) the love and joy they felt. Not only did they experience the dream wedding they had wanted, but also they got the chance for some epic photos. The colors that lit up the sky for those few shots we got between the raindrops made an unparalleled backdrop for some stunning wedding photos. 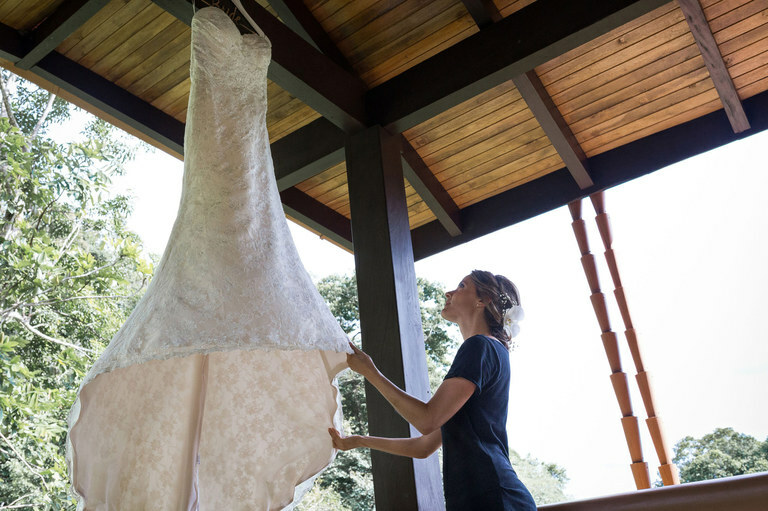 Do these photos make you want to have your special day in Costa Rica? Check out even more reasons to get married in this awesome country! 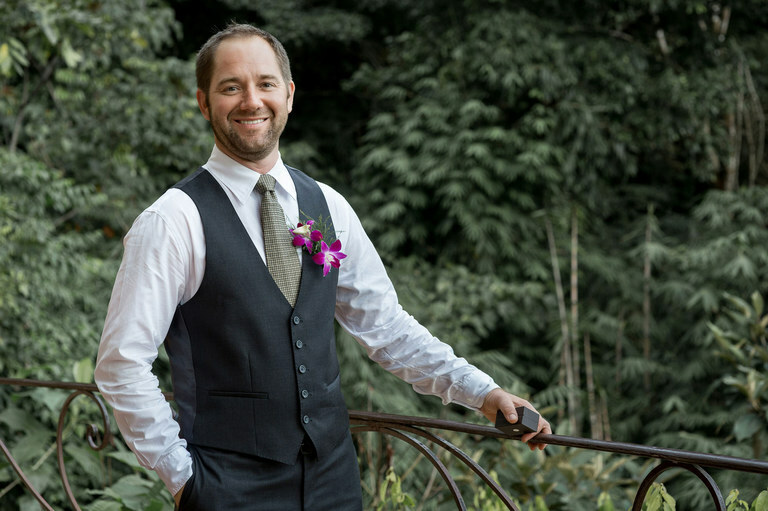 © 2019 Costa Rica Wedding Photography | Kevin Heslin Photography|ProPhoto Website|Design by Northfolk & Co.